Staff photo by TOM KING Former Daniel Webster coach Louie Bernardini, center, is joining forces with Rivier head man Anthony Perry, right, this spring for the Raiders as the newest addition to the coaching staff. Yes, about 11 months since that historic night at Historic Holman Stadium. It was the last athletic event ever for Daniel Webster College, a single nine inning baseball game vs. local rival Rivier University. The Eagles rallied for a dramatic win, the two teams posed for a lifetime picture at home plate. A few hours earlier, at that same home plate, is when the seed was planted for the future of DWC coach Louie Bernardini. They did, and another former Eagle has landed. 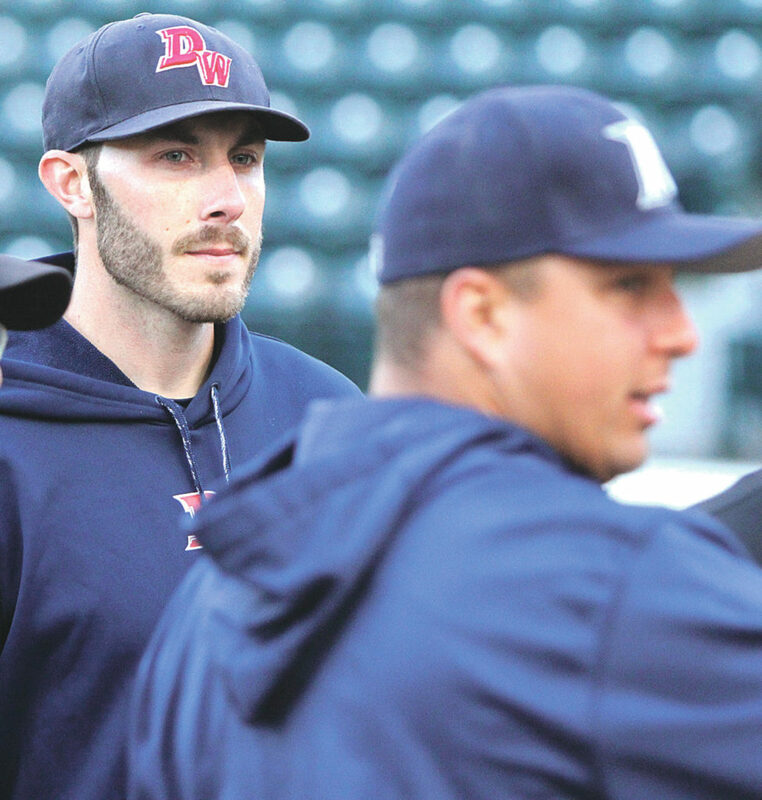 Eventually Bernardini, after weighing some options, agreed last month to become the Raiders Associate Head Coach – basically in charge of the pitchers, his specialty, and also work as Perry’s right hand man and top recruiter. Bernardini belongs staying in baseball. He did secure a fulltime job, working for a recruiting company in Windham. He and his wife started a family, have two young childeren, a home in Merrimack, and this is where they want to stay. “My wife and I knew we weren’t going anywhere,” Bernardini said. So the options were somewhat limited. Bernardini was a finalist for the Saint Anselm job. 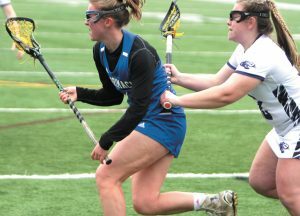 He had helped out in the fall over at Southern New Hampshire University. But the fits just weren’t right. Still, you have to remember the human element here. Bernardini, as well as others from the Eagle athletic departement who were displaced from the school’s closing its doors, needed to feed their families. But luckily for Bernardini, that wan’t too much of a concern after things were done last spring. Some of those offers were in baseball, but most in the non-sports world. For Bernardini, location, location, location was a key. He was really impressed with how SNHU came in and basically rescued DWC for a year, so he started helping out during fall ball there. At least it gave him a taste of the game for a bit. You have to be glad for Bernardini, a well-educated, sharp coach who is superb at the mental part of the game and looking out for the well being of the student athlete. He arrived in November of 2015 for his first head coaching job after stints at LIU/Brooklyn, Brown, Springfield, and even the Brockton Rox. After one full season at Daniel Webster (2016, most wins at the school by a coach in any inaugural season there), had the rug pulled out from him and his dreams of building a program. Just imagine what he and his players went through last spring. But this winter, the sun rose again on Bernardini’s coaching career. He and Perry had always had a good relationship, and it bore fruit. “He’s helped tremendously,” Perry said. And Bernardini, like most coaches who arrive at the school, loves the atmosphere at Riv. What’s not to like? Nice campus, great student-athletes, super athletic director to work for in Joanne Merrill, and facilities that are always improving. And there’s always the memory of that final night at Holman. But, if the weather breaks, the Raiders will likely play a few games there next month. What a triumphant return for Bernardini that will be. And Louie Bernardini’s a fit. The area is lucky he’s stayed.